Hi, Jenn Christensen here from the Candy-Coated Mystery series set on Mackinac Island. Can you believe they have Christmas decorations in the stores in October? What happened to Halloween? I love Halloween and Thanksgiving. Shouldn't there be Thanksgiving decorations before Christmas? You know, turkeys and pilgrims and cornucopias full of harvest foods? But no, the end of September and people are already Christmas shopping. I know people who have the entire holiday done by the end of October. Where's the fun in that? I like my holidays to come in order. Don't you? But then there's this E-novella. 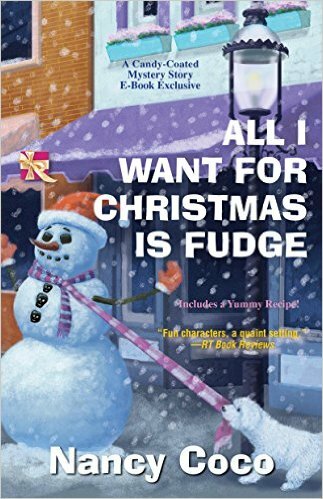 "All I Want For Christmas Is Fudge" that is available now. The only reason I mention it is because it's my big debut. You get a novella written from my point of view. I was really excited when our author decided to write from my point of view. I happen to think it's the best point of view ever, but then I am biased. So I do forgive her for putting out this holiday book in October. It is an e-book exclusive mystery full of Santas and snow and holiday cheer. Check it out. You get to see how beautiful Mackinac Island is in the winter and just for fun we've included a fudge recipe with some heat to warm you up after the season chill. So my question to you is this: When is the earliest you are completely ready for the holiday season? I do enjoy Christmas in July (because I like to start shopping early and not stress out later in the mad Christmas rush ). I work in retail, so if I can't get the tree up right after Thanksgiving, it will usually wait til the 22nd or 23rd of December! I try to shop all year long so it's not such a big chore at the end. Some years I succeed, others I don't. I mail packages to Europe, so those have to be ready in November. I'd better get going! I do love to make fudge and peanut brittle for my overseas packages and hope I get that done this year. I'm ready for Christmas by August and am absolutely delighted to see Christmas merchandise on store shelves. It's my absolute favorite time of the year and I want to enjoy it for as long as possible! I think it really depends on the weather. Last year I had the Christmas tree up a few weeks before Thanksgiving because it was wintry white outside and it stayed cold. Also I had to take the tree down in the middle of December as we were leaving for Arizona. I missed having all the decorations at Christmas time but was glad to enjoy them before. It is also my favorite time of the year. There's a holiday season? Geeze, we shop for each of the kids when they start screaming that Channukah is already here and we forgot to buy anything so we stuff cash in their hands (or their parents if they are young). It's become so common now that I hardly notice the Christmas decorations. I skip past them to the fall and Halloween stuff. They sure don't put out as much now. As far as gifts, we shop deeply discounted sales throughout the year sand place the selections safely hidden until Christmas. I start Holiday baking shortly before Thanksgiving and traditional, special family baking the week before. Due to atypical family circumstances we do very little actual decorating. Quite honestly, the last 2 Christmas holiday weeks one or the other of our daughters been hospitalized out of State. 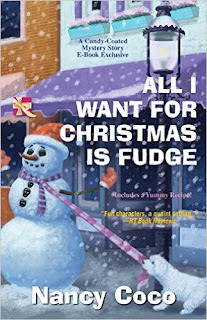 I love the Candy-Coated Mystery series set on Mackinac Island (and the fudge). So glad I read/follow this blog as I didn't know a Christmas themed book was being released.